Iran takes overall male, female titles at 1st WTF World Cadet Taekwondo Championships held in Baku, Azerbaijan on July 27, 2014. BAKU, Azerbaijan (July 27, 2014) —- Iran showed its supremacy in taekwondo as it clinched both the overall male and female titles at the 1st WTF World Cadet Taekwondo Championships, which wrapped up in Baku, Azerbaijan on July 27, 2014. The inaugural WTF World Cadet Taekwondo Championships, which were for the youth aged between 12 and 14, took place at the National Gymnastic Arena in downtown Baku, drawing a total of 574 athletes from 65 countries. In the male division, Iran took home three gold medals, three silver medals and one bronze medal for a total of 82 points for the top honors. Russia came next with one gold and three silvers for a total of 53 points, followed by Korea with three golds for 45 points. The United States stood at fourth with one gold and one bronze for 41 points, while Mexico followed with one silver and two bronzes for 36 points. In the female category, Iran grabbed four golds and one silver for a total of 74 points, followed by Turkey with two golds and five bronzes for 62 points. Chinese Taipei came next with two golds and two bronzes for 49 points, followed by Russia with two silvers and four bronzes for 49 points. France stood at fifth with two silvers and one bronze for 38 points. A Daedo protector and scoring system and an instant video replay were adopted at the Baku championships, while a head gear with a visor were used for the safety of the young athletes. Korea's Jeong-min Seo, the gold medal winner in the male -33kg weight category, was selected as the male Most Valuable Player (MVP) of the inaugural cadet championships, while Turkey's Tugba Yilmaz, the gold medalist in the female -51kg division, became the female MVP. The Good Fighting Spirit Award went to Ukraine, while the Active Participation Award went to host Azerbaijan. The Best Referee Awards went to Nigeria's Peter Emmanuel Oghenejobo, Singapore's Teong Chin Lim and Canada's Ms. Susanne Maria Mitchell. Iran's Hossein Ali Naeimi was selected as the best male team coach, while Iran's Mahroo Komrani Najafabadi was named as the best female team coach. On the fourth and final day of the 1st WTF World Cadet Taekwondo Championships, Croatia's Kristina Cerina brushed aside a stiff challenge from Iran's Zahra Shojaei Rad to win the female -59kg final match 21-12 for the gold medal. The bronze was shared by the Great Britain's Simone Abley and Chinese Taipei's Yen Hsin Yeh. In the female +59kg final match, Iran's Zahra Pouresmaeil beat Russia's Anastasiia Baklanova 10-5 to earn her country the gold medal. In the same weight category, France's Della Sassi and Chinese Taipei's Yun Ci Pan shared the bronze medal. In the male -61kg weight division, Iran's Mehrdad Khazaeipool needed a fourth golden-point round to earn his country the gold medal against Mexico's Luis Osorio. 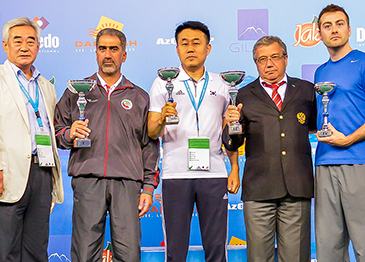 Spain's Javier Gonzalez Garcia and Turkey's Huseyin Kartal shared the bronze medal in the same weight division. In the male -65kg final match, Korea's Myeong-gyun Byun defeated Iran's Mohammad Amin Pouladi with a referee-stop-contest victory at 15-5 in the third round for the gold medal. The bronze went to Egypt's Ahmad Mohamed and Denmark's Wassim El-Jilali. In the male +65kg final match, Iran's Amirhossein Voghouei Azar defeated Kazakhstan's Nartay Urazbayev with a referee-stop-contest victory at 32-7 in the second round for the gold medal. In the same division, the bronze went to Uzbekistan's Islomjon Adkhamov and Turkey's Muhammed Acikgoz.